Ideal for domestic or industrial use. Carrying handle with a pouring lip. 3 gallon capacity. .. Heavy duty yellow builders bucket. Carrying handle with a pouring lip. 3 gallon capacity. .. Heavy duty black rubber bucket. Carrying handle with a pouring lip. 3 gallon capacity. 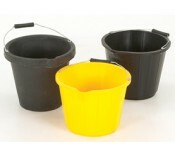 ..
Yellow heavy duty roofers ridge bucket Has recess making it ideal when working on pitched roofs.. Traditional galvanised bucket. Ideal for domestic or industrial use. 10 Litre capacity. ..
Gorilla Tubs are flexible, which is the key to the millions of jobs they can perform. They are.. These traditional heavy duty galvanised mop buckets have a steel sieve and 2 gallon capacity. ..